1996: Looking back at STAR TREK: FIRST CONTACT | Warped Factor - Words in the Key of Geek. Tom Pheby revisits the 1996 big screen outing for the Next Generation crew, Star Trek: First Contact. Star Trek had become a little bit stagnant before "First Contact" burst onto the screen in a blaze of glory and significantly upped the ante. Now before Trekkies want to pelt my house with beetle dung and put blancmange through my letter box (an odd combination I grant you), allow me to elaborate. All in the world of Trek was doing OK but it wasn't progressing at a rate of knots, the Next Generation crew were seeping into our affections and subconscious, but there was a need to cement this with something noteworthy and to propel the whole franchise forward, this was that opportunity. 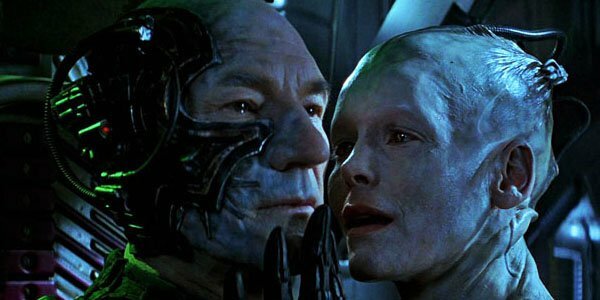 Star Trek: First Contact really doesn't disappoint in any department, from the moment we see a captive Picard at the mercy of the Borg, in danger of losing his right eye, up until the final credits it's as if someone handed the director a note saying "failure is not an option". So Jonathan Frakes (aka Commander Riker) grabbed the movie by the scruff of the neck and threw everything but the kitchen sink at it - remarkable really as this was his debut as a director on the big screen. What Frakes delivered with First Contact was a visually outstanding piece of cinema with a solid script and string of excellent performances, not least of which comes from the egg-headed Patrick Stewart as Jean Luc Picard. He seems to have adopted Kirk's disdain for authority and acts on the same gut instinct (a prerequisite it would seem for anyone in the Captain's chair). As for the story, the new spiffy Enterprise-E is going through the motions in space when the crew learn of an imminent attack on planet Earth by the Borg (not to be confused with Swedish Tennis champion Bjorn Borg - but what a Trek film that would've been!) The Borg from the Star Trek Universe are a mash up of flesh and machine that have a nasty habit of assimilating whatever they encounter, using the species knowledge or data and all available technology for their own benefit. They are kind of like a bunch of dominant sponges in space. In First Contact the Borg turn their attentions to our Mother planet, and although their main ship is destroyed by the Federation, a smaller Borg vessel manages to wriggle away through some sort of hole in time and space, or a temporal vortex to be precise (sounds like some sort of lavatory cleaner). The plan is to torment and take over our humble evergreen orb by replacing humans altogether. Picard is instructed not to take action but we know that he'll blatantly ignore that and chase after them regardless of the risks. This provides a much needed shot in the arm for Stewart's character who manages to go through a gamut of emotions due to his treatment by the Borg's some six years earlier. He is so full of testosterone this time around that he could explode at any second. Throughout First Contact we get to experience Star Fleet Picard, hostile Picard, vengeful Picard, Picard the argumentative, to hell with it all Picard and lost his senses Picard - oh yes, it's a very personal journey alright, one that gives us a deeper insight into the character and it undoubtedly brings out the best in Stewart. Riker: "Someone once said, 'Don't try to be a great man. Just be a man and let history make its own judgements.'" Cochran: "That's rhetorical nonsense. Who said that?" Riker: [smiling] "You did. Ten years from now." It's basically all clever stuff. Maybe a bit too clever? Hell no, this is Star Trek. Of course there's a lot to take in but it's not as baffling as it sounds and the two pronged storyline represents Trek at its absolute best. One of the story threads has to dominate and thank God it's Picard's one or the film would have disappeared without a trace. Riker's yarn is important in terms of entwined plot but Picard's is more intriguing as he undertakes his own personal vendetta to even a score, and become a hero in doing so. I almost cheered as he puffed out his chest, threw away the manual and ignored the consequences. The one thing that makes the whole Borg plot a little odd is the bee type analogy, complete with the Queen played by Alice Krige. Whether the villains needed this human-like incarnation is a question of preference I guess, but I just thought they seemed a lot more menacing without a face, as it adds to the fear factor. That's nothing against Alice Krige, who is excellent, it's just the Borg Queen seems to be an unnecessary cherry on an already appetizing cake. 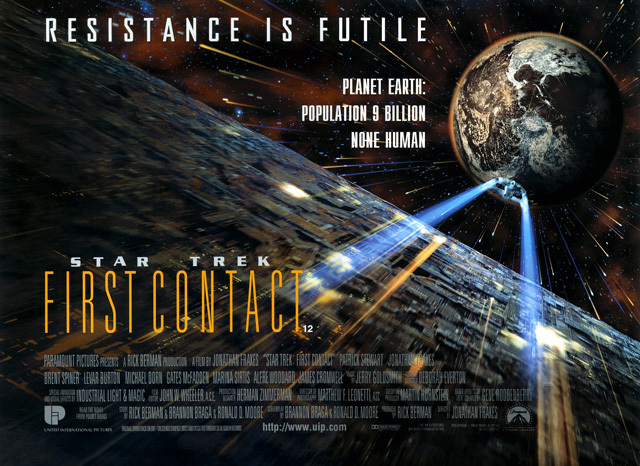 It's just a minor quibble of mine and we can gloss over this meaningless grumble by noting that the action in First Contact is absorbing and exciting, with genuinely gripping and tense moments. The effects throughout are fantastic and the performances from everyone concerned are brilliant, making this the strongest of the Next Generation outings. In fact it sits in my Top 3 Trek movies, alongside The Wrath of Khan and Into Darkness (yes I include a dreaded reboot in my top three!). I'll finish with a brilliantly funny moment that crept into a conversation I had about this film with a few friends recently, which, if you'll indulge me, I'd like to share it with you. One friend, Doug, announced that he couldn't enjoy the film because Jean Luc Picard is supposedly French but has an English accent (it was a genuine Karl Pilkngton moment). I explained that the French language had become redundant in the future, but that only seemed to make matters worse. "What happened to it? Where did it go?" he added causing more hilarity. "It became obsolete, died out", "that's rubbish" he said "it's like me calling myself Mustapha and talking with a Cockney accent". We ignored pointing out the obvious of London born Lebanese or Egyptian folk with a similar name for fear of making matters worse. The one thing this banter illustrates perfectly is that for Trek fans anything is possible, but to non-Trekkies time travel, alien races and warp drive technology can be easily accepted, yet it can sometimes be a leap too far to imagine an English speaking Frenchmen! I'll continue to work on Doug and show him what he's missing out on. Bless Him.